Toe Sox keep the toes spread and separated so that they can stretch naturally. The muscles in your feet need to be exercised just like every other muscle in your body. Toe Sox help strengthen the muscles of your feet allowing for overall better balance and posture. Toe Sox increase both your balance and, more importantly, your control. You no longer need to worry about slipping on the reformer or falling off the cadillac; with a non-slip sole, your Toe Sox will give you that added control. Allow your toes to spread more naturally. Our toes are crammed in socks and shoes all day and so they very mush deserve this liberation. Reawaken your feet and wiggle your toes to get that blood circulating. Toe Sox are a hygienic alternative to bare feet. If everyone wore toe sox in your favorite clean Pilates studio, the studio would remain that much cleaner! ToeSox feature a horizontal stripe at the metatarsal head which is a great visual cue to proper foot alignment during reformer, cadillac and mat workouts. It’s a quick way to check your foot alignment and readjust as needed. With seam free 100% cotton, your toes will be comfy and very happy! Various colours available in studio. Prices and styles subject to change. Five Toe Sandals with four posts create space between each toe to help you spread all of your toes for proper alignment. Spreading your toes will strengthen your feet and increase blood circulation. Many foot ailments are caused by poor toe alignment and poor circulation. Five Toe Sandals secure each toe providing improved stability without flip flopping.Get stronger, healthier and happier feet. Finally! Flip flops that are good for your feet! Check Toe Sox website for current available styles. Prices and styles subject to change. Sandals special order only. Grip Gloves by ToeSox provide secure hand placement on any surface. 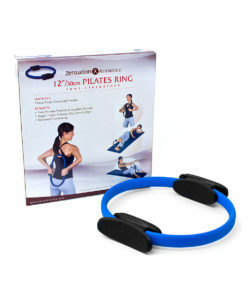 Great for yoga, Pilates, spinning, and for traveling without a mat. The half-finger style gives fingers tactile sensitivity. A terry cloth thumb for perspiration absorption. 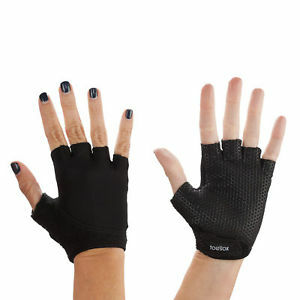 With an adjustable wrist band and form-fitting fabric, Grip Gloves are securely fitted and comfortable. Glove material is 50% Polyester; 50% Microbfiber. Grip Gloves special order only. Sturdy, solid as a rock, the Pilates Cadillac stands freely and will not shake, rock or flex. Black powder coated steel. Sliding trapeze and cross bar move freely and easily and lock in any position. Platform height is adjustable to suit. 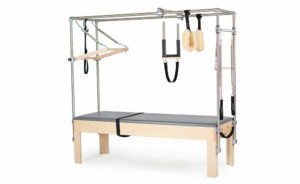 10 spring set up with sliding trapeze, adjustable height push through bar, arm spring sliding cross bar and roll down bar. Optional decorative maple rails. The Cadillac comes crated and partially assembled. Easy 1-2-3 assemble, takes 20 minutes. The most trusted Pilates Reformer available today. Instructors and students alike have come to rely on the dependable quality of this Pilates Reformer. It is a carefully updated machine which follows the traditional rules and standards first outlined by Joseph Pilates. 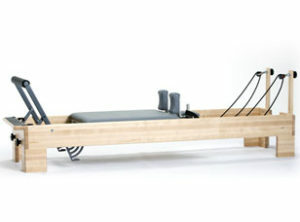 The work horse of any Pilates studio, this Reformer stands the test of time. Solidly built and fairly priced, it is good value. We guarantee it. Solid maple wood frame. Arrives fully assembled. The frame and 4 rungs are all powder coated steel. The sides are maple marine ply with a 5 layer clear coat. 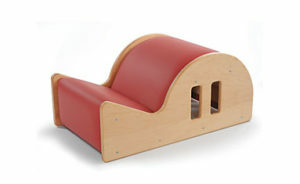 Barrel arc is vinyl upholstered over quality foam. Barrel to ladder distance adjustable 8″. Some assembly required. Our small barrels are available in 6″, 8″ & 10″ arcs. Like our large barrels, the small barrel is a solid maple unit with a maple veneer and your choice of colours for the Naugahyde cover. Constructed from maple marine ply, with 5 layers of clear coating. Comes with 2 sets springs, 2 heavy and 2 light. Three spring connection points with easy access from back of chair. Rubberized foot rest and 6 rubber feet to keep chair slightly off floor. Double stitched vinyl seat with quality foam. Split paddle models are now available. Both single and split paddle chairs each have a model equipped for handles. Ships assembled in a box. 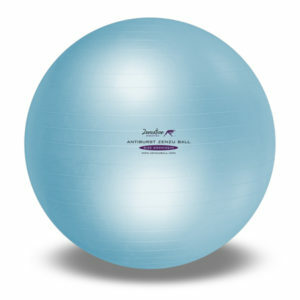 Professional quality exercise ball with hand pump. Can be used for Yoga as well. Coated steel with soft, textured ‘sticky’ pads. Tone, strengthen, sculpt, adds resistance training to your workout with added inner & outer stability pads. Free workout chart included. 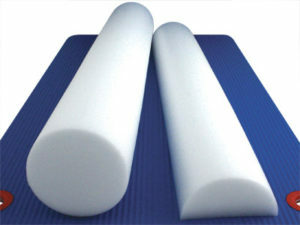 We have half and full foam rollers available. A Pilates routine for every morning schedule! You already know that morning workouts are the best way to exercise regularly, manage weight, and energize your day. Morning Pilates Workouts makes it easy to maximize the benefits of your early-day routine no matter what your energy level is or how much time you have to spare. eturn to Life Through Contrology is essential Pilates reading. 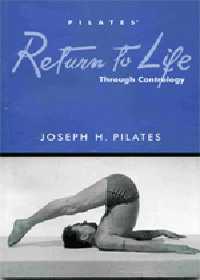 In this one small book, Joseph Pilates conveys the breadth and power of the Pilates Method. Covering philosophy and technique, Pilates outlines the effective and enduring approach to whole body health that now, 63 years since the first publication of Return to Life, is one of the fastest growing fitness trends in the world.